A custom wine storage room is a great addition to a residential or commercial space. A climate controlled wine cellar is the ideal location for wine collectors to age and display their wine collectibles in an elegant way. Wine cellar designs Houston focuses on both the functionality and the appearance of a wine cellar space, because it will not only serve as a storage area, but also as a social hub. How to build a wine cellar requires four crucial prerequisites that allow a custom wine storage space to function efficiently and prevent serious damage to the room and refrigeration equipment. The four essential elements of a climate controlled wine room are insulation, vapor barriers, mold resistant wallboards, and an exterior grade wine cellar door. Proper insulation helps achieve the best possible environment for storing and aging fine wines. All walls, ceiling, and flooring of a wine cellar space must be insulated. The R-value recommendation for interior walls is R-13, while the recommendation for the exterior walls, flooring, and ceiling is R-19. R-value stands for the thermal resistance of an insulation material. The primary function of a vapor barrier is preventing the buildup of moisture through the walls, flooring, and ceiling of a wine storage space. It is usually made of plastic or foil sheets, and it covers the entire wine cellar envelope. Vapor barriers must be installed on the warm side of all walls, ceiling, and flooring. Mold resistant wallboard or drywall is a construction material made from gypsum, and used in interior wall applications. Gypsum plasterboard systems allow for faster construction and general flexibility in wine cellar designs. Drywalls also have low thermal conductivity and high thermal resistance, which helps minimize the load of wine cellar cooling systems, thus reducing energy costs. 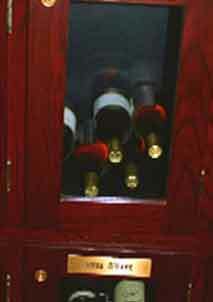 Another basic component of wine cellar designs and construction is an exterior grade wine cellar door. The entry door to a wine room not only provides a good seal to the door opening, but also adds to the aesthetic quality of the storage space. 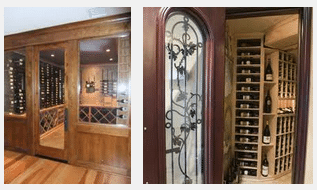 The characteristics of a quality wine cellar door include the following: weather-stripped on all sides and along the jambs and an automatic door bottom. All doors made from glass must be double-paned and insulated. Other key components of wine cellar designs and wine cellar ideas on how to build a wine cellar are wine storage solutions, lighting fixtures, and flooring materials. The choice of racking solutions is also crucial to the aging process, and the overall appearance of a custom wine cellar. 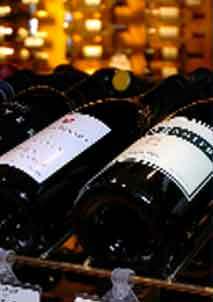 Wine racks are designed to facilitate the proper placement of wine bottles during storage. These racking systems are constructed from various materials, such as wood and metal. 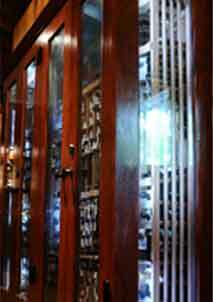 They come in a range of sizes and styles that can complement various wine cellar ideas on proper wine storage. Wine cellar designs Houston also pays attention to the type of lighting fixtures installed in a wine room. Ultraviolet rays can potentially ruin the quality of wines. Hence, installing windows and high temperature bulbs should be avoided. LED lighting, along with timer and dimmer controls, can help reduce the overexposure of wine bottles to light sources. Wood, stone, cork, tile, and recycled wine barrels are some of the common products used in wine cellar flooring. These flooring materials can bring a unique personality to a wine cellar space, as well as provide an elegant vibe. Carpets should be avoided, as the cool environment of the storage space can encourage mold growth in the carpet fibers. Wine cellar designs Houston is committed to designing and building a wine enclave wherein wine collectors can proudly showcase their wine collectibles. They have a team of experienced wine cellar experts who know the dos and don’t s of how to build a wine cellar. They work closely with clients in order to accurately capture their wine cellar ideas, and incorporate those into the design of the wine cellar. 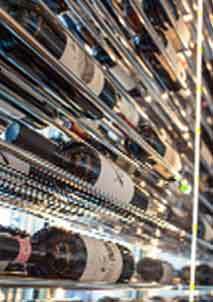 Check out Wine Cellar Spec Houston for more wine cellar ideas!